Most of the lights feature nearly identical specifications. The type of LED and resulting viewing angle is the primary distinction between the different varieties. Those with fewer, larger, more focused LEDs offer a tighter beam angle which is visible from a longer distance when viewed straight-on, but isn't as bright from off angles. The lights with a larger quantity of smaller LEDs aren't as visible from far away, but can be seen from a wider angle. All headlights claim 90 lumens and all taillights claim 44, although there is probably some variation between models in the actual output. The various versions also have slight differences in battery life and weight, again stemming from differences in the underlying LED technology. The different LED layouts on variations of the Mob also offer different flash patterns, which can be viewed interactively below. The output level of the Mob lights seems to be extremely well regulated. I measured the brightness of a Kid Grid headlight through its runtime, and the light remained at 100% of its initial output for 3:20 hours before turning off. The different models have different specified battery life, and based on the results from the Kid Grid I measured, I expect all of them will meet or exceed their stated runtimes. All of Knog's Blinder lights charge through an exposed USB plug which simply plugs straight into any available USB outlet. 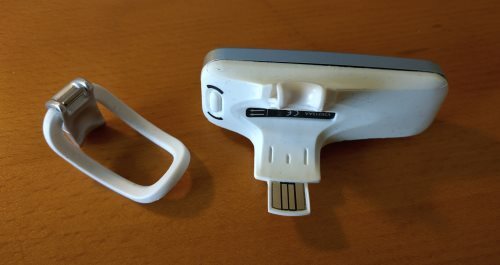 No cables, no adapters, just straight-up built-in USB. I have mixed feelings about this design. You don't ever have to worry about bringing a charger with you, but it can be cumbersome getting the plug into USB ports if there isn't ample room around the port. I tend to have a lot of USB devices plugged in at any given time, and it's tricky getting the Knog lights in between everything else. On some previous Blinder models the charging plug folded out from the body of the light, and was prone to snapping off. Knog has cleverly remedied this issue by building the plug into the tip of the strap. Higher-end Blinder models like the Blinder Road and Blinder Arc come with a short USB extension cable to help facilitate these issues. The lower-cost Mob series though doesn't come with any such cable, leaving you to your own devices when it comes to USB plug wrangling. Each style of the Blinder Mob series has different flash patterns depending on the type and layout of LEDs, but they all share similar characteristics. 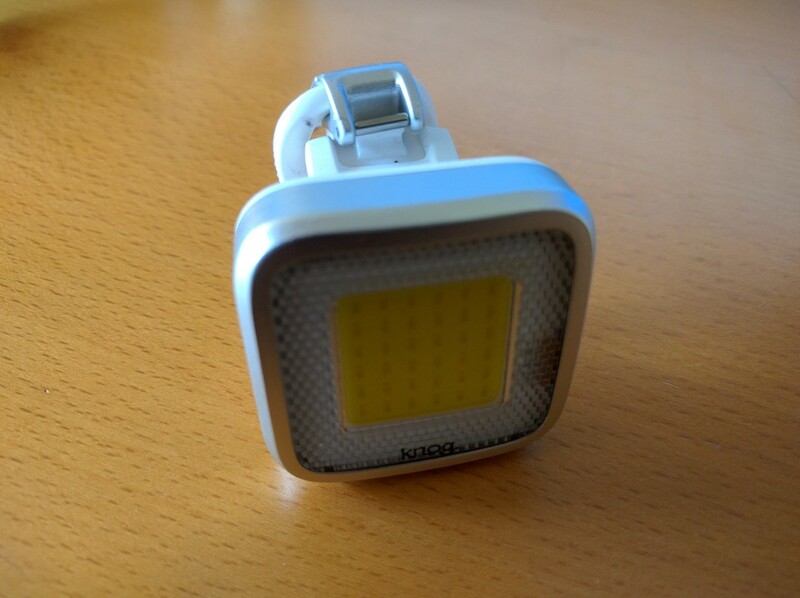 All of the lights have both high and low steady-on modes, and a fast simple flash which uses all LEDs on the light. Each light also has two subtler flash options, with more significant variation depending on the LEDs used. Mr. Chips has my favorite flash patterns, with large sections of the light illuminating simultaneously. Kid Grid was my least favorite - in the "subtle" mode, every other LED on the light flashes at once, alternating. The speed of the flash increases, then all of the lights flash once together. This pattern seems like a waste of this large array of LEDs, as for most of the cycle only half of the LEDs are operating. Overall I'm rather disappointed in the flash patterns available on the Mob series lights. Knog's previous Blinder 4 light had 6 different flash patterns, all of which used all of the LEDs at once to maximize visibility, and with various options ranging from stunning to very subtle and easy on darkness-adjusted eyes. 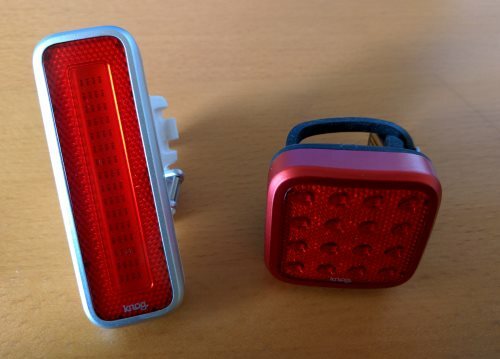 The switch from simple yet effective patterns to patterns which look fancier on the shelf of a bike shop but are less effective in real use is a disappointing step backwards, and one which I hope Knog will remedy in its next iteration of lights. As with all of Knog's Blinder lights, the Mobsters are held in place with simple silicone straps built into the light. One size fits most, but just in case Knog provides a larger diameter strap with each light. 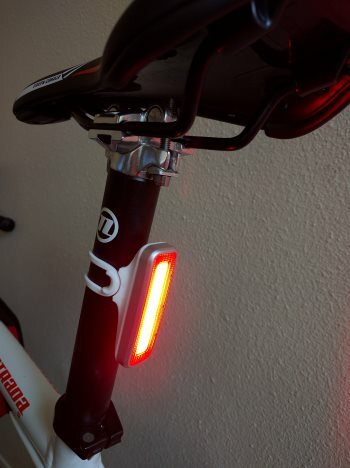 The taillights have a slight angle built into the mount, so that when mounted to a typical seatpost they remain level with the road. Knog's signature silicone straps are super convenient if you mount your lights to the traditional locations – handlebars and seatpost – but leave little to no options for mounting elsewhere on the bike, like say on a rack or seat stay. If you're cool with the conventional placement though, the Blinder Mob will look cool in that spot. All of the Blinder Mob lights are controlled by a small button on the back side. The button must be pressed and held to turn the light on, which helps prevent accidentally activating the light. A quick press cycles between modes, and the light remembers your previous mode when you turn it off. Another press-and-hold turns the light off. A quirk of Knog lights – all of theirs I've tried so far – is that the light doesn't turn off until you release the press-and-hold, whereas most lights turn off after a couple seconds when you hold down their button. I'm ambivalent towards this distinction... I don't see any particular advantage to either way, it just always takes me a few tries to readjust to the Knog method because most other lights don't behave the same way. Of the five variations, Mr. Chips and Kid Grid are my two favorites. Both have a large illuminated surface area, which helps the light be seen even from a long distance. The COB technology used in Mr. Chips isn't as bright in direct sunlight, but the array of surface-mount LEDs in Kid Grid don't seem to suffer from that issue. Mr. Chips also has my favorite flash options of the new models, whereas I'm less of a fan of Kid Grid's flash patterns. With the primary variation between models being the beam angle (and thus effective beam distance), the best choice for a particular type of riding will vary. If you're usually in urban settings where you want visibility from wide angles, one of the wider-angle options will be good. If you generally ride on higher speed roads or less populated areas, you might want one with a narrower beam which won't be as visible from the sides but will be seen from a much greater distance when viewed straight-on. The Blinder Mob headlights are well-crafted and effective as visibility lights, but for me it's difficult to justify spending $45 on an 80 lumen be-seen light when a full 350 lumen headlight is only couple dollars more. Even if you don't need a light bright enough to illuminate your path and just want to be seen, you'll get better battery life in flashing mode out of a larger light at the same price. That said, if you rarely bike at night and want an unobtrusive, light-weight, sleek light to throw in your bag just in case your afternoon ride runs late, these lights might be a good choice. In my opinion, the Blinder Mob taillights are more compelling. They're cost-competitive for lights in the 40-50 lumen range, have a much larger illuminated surface area than most lights, and are lighter-weight than much of the competition. That weight comes at the cost of battery life though – even on flashing mode, Mr. Chips only lasts 2.6 hours, whereas the similarly-priced Cygolite Hotshot 80 Pro lasts (2:45) hours on steady and over 50 hours on a comparable flash mode.